Grammar: <goud> [adjective, noun] [het goud]. The adjective “goud” is part of the group of “stoffelijke bijvoeglijke naamwoorden” or “material adjectives”, and is therefore declined differently (see example 3 below); read more in “Declining adjectives“. The Dutch word for “to shine/to glitter” is “blinken” and is pronounced a bit like “bling-can”. I wonder if there is a relation with the hip-hop slang term “bling-bling“! To promise someone the sun and the moon. Literally “to promise someone golden mountains”. There is no place like home. Literally: “one’s own hearth is worth gold”. The word “goudmijn” is often used figuratively. One of the readers of the Dutch word of the day wondered if the Dutch city of Gouda has something to do with gold. Gouda is well-known for its cheese, the “Gouda kaas” or “Goudse kaas” (“cheese from Gouda”). The original settlement of Gouda was at the peat river “Gouwe” and a theory exists that says that this peat river had a golden glare and hence the name “Gouwe” originated. Read different theories at http://en.wikipedia.org/wiki/Gouda. The word “goud” appeared earlier in “DWOTD 37. Vis” and “DWOTD 83. Morgen“. 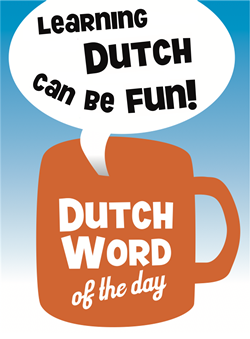 This entry was posted in Dutch word of the day, DWOTD 1.0, Vocabulary Basic and tagged edelmetaal, goud, gouden by Dutch Gurus. Bookmark the permalink.